Problem: You know you should take regular breaks from your computer screen and keyboard but time just seems to pass by. This can result in eye strain, posture problems and repetitive strain injury. 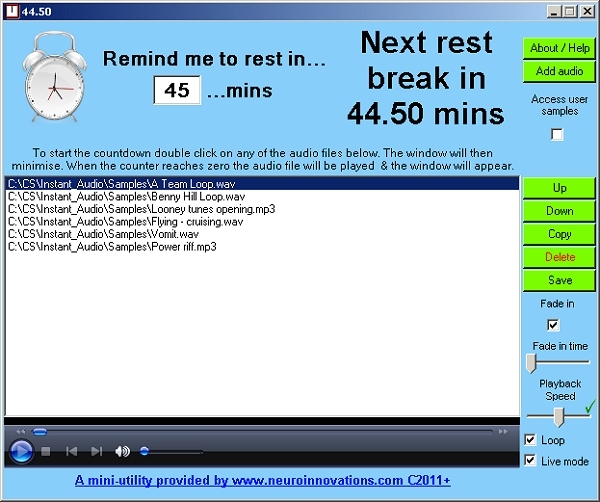 Solution: Rest Reminder is a free media player designed for use by anyone that wants or needs to be reminded when it's time to take a break. You may then choose to take a break or disregard the reminder. The software does support use on XP/Vista/Windows 7 Netbooks.